August 29, 2017 This post may contain affiliate links. Learn how to make a frittata. This healthy, vegetable and sausage frittata is paleo, gluten-free, sugar-free and dairy-free. An easy, Whole30 approved breakfast! Isn’t it the best feeling to learn something new? I learned something new lately. I learned how to make a vegetable and sausage frittata! How many of you have ever made a frittata? I never paid one bit of attention to frittatas until recently. I’m always looking for healthy, protein filled breakfasts. If I can start the day with a good breakfast, there’s more hope that I’ll finish the day well, too. My go-to, easy breakfast is often these egg muffin cups, but those little egg bites have a competitor in town and it’s the frittata. I never knew how simple frittatas could be, how easy the leftovers are to warm up for another day’s breakfast or even a quick lunch. So how did I learn about this wonderful new-to-me dish? So I fell in love with the egg frittata, a breakfast dish that is really so versatile.What is a frittata? It’s an egg-based dish, similar to an omelet and a quiche. It starts cooking on the stovetop, then finishes cooking in the oven. It’s versatile because you can add just about any ingredients that you’d like…vegetables, meats or cheeses. I decided to make a gluten free, grain free, dairy-free and sugar-free frittata to give you the healthiest breakfast possible. I diced red pepper, zucchini and carrots in my little Ninja that I just love so much. Then I added in 1 cup of our homemade turkey sausage, that I already had browned and in the freezer, ready to be added to omelets and egg dishes. This homemade turkey sausage is the best and it adds such flavor to this skillet breakfast. Saute this colorful veggie mixture in 3 tablespoons of coconut oil in a cast iron skillet over medium heat. Cook and stir until the veggies are soft, about 5 minutes. While the veggies are cooking, beat large 8 eggs with a mixer for about 3 minutes until the eggs are frothy and bubbly. Why do you have to beat the eggs? This will help the frittata to be as light and airy as possible. Pour the frothy eggs over the cooked veggies and use a spatula to gently fold in the eggs. Don’t stir the eggs, just gently use the spatula to break up the veggies, making sure the egg soaks down around them. Turn the stovetop down to medium-low. The whole mixture will look kind of strange, but that is totally fine. Turn the oven on to high broil so it can start getting hot while the frittata starts to cook on the stovetop. After about 7-10 minutes, the egg will start to set around the edges of the skillet. Once this happens, put the whole skillet in the oven (Make sure your skillet is oven proof. Cast iron is perfect for this!) and allow the frittata to sit under the broiler for 2-3 minutes until the top is golden brown. Watch the frittata carefully while it is under the broiler. It will cook quickly! Once the frittata is golden brown, pull it out of the oven and slice it up like pie. This recipe will serve about 6-8 people depending on the size of the slices. Looking for more healthy recipes? We love these! Just cooking for a few? This warms up so nicely in the microwave for another day’s breakfast. A healthy breakfast ready in under 30 minutes. Easy. Simply nutritious. Q: What ingredient would you add to a frittata? Learn how to make a frittata! 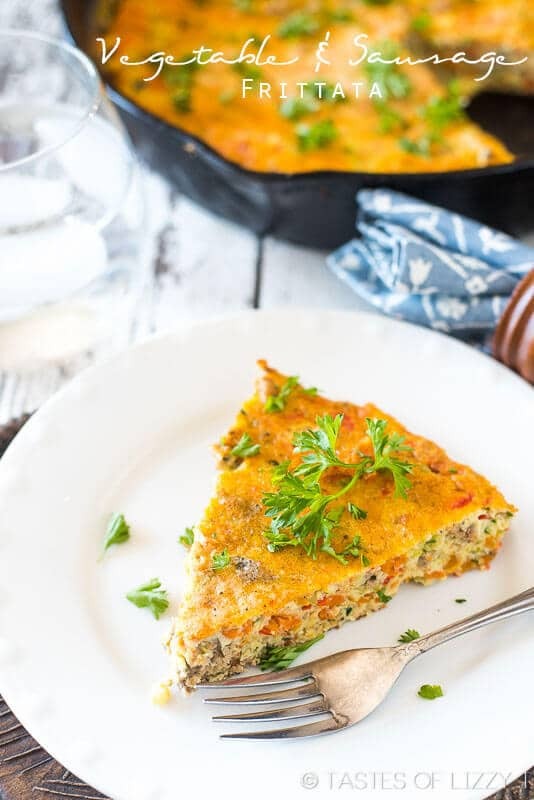 This healthy, vegetable and sausage frittata is paleo, gluten free, sugar-free and dairy free. Whole30 approved breakfast! Heat a 10" cast iron skillet over medium heat. Add the coconut oil and allow it to get hot. Saute the carrots, zucchini and pepper in the hot oil for about 5 minutes or until the vegetables are soft. Use a whisk attachment for a mixer and beat the 8 eggs on medium speed until they are light and frothy, about 3 minutes. Pour the frothy eggs over the cooked veggies. Turn down the stovetop to medium-low and use the spatula to gently move the veggies just a bit, allowing the eggs to soak down to the bottom of the pan. There will still be frothy eggs on top. Don't stir too much. Allow the frittata to cook for 7-10 minutes, until the edges are set. Turn the oven on to broil and make sure the oven rack is in the middle of the oven. Place the cast iron skillet into the oven and broil for 2-3 minutes or until the top is golden brown. Watch carefully since the frittata will cook quickly under the broiler. I just love frittatas! It’s so easy to jam-cram them full of great flavors and loads of healthy veggies! Your version is just gorgeous, and I love how quick and easy it is, plus your great tip about rewarming leftovers in the microwave (total bonus! ).